On Tuesday, 22nd November 2016 Debarry purchased Kidman Lady Eclipse K015 at the Kidman Looking to the future female sale. 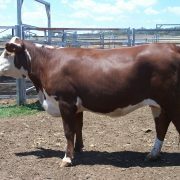 Kidman Lady Eclipse was AI’ed to Yavenvale Kahuna K115 on 04/07/16 and then ran with Wirruna Elder E327. Lady Eclipse was chosen because of her class and quality. We consider her to be a standout in the P.T.I.C heifers that were offered for sale and we look forward to seeing how she breeds on in our program.